Get your own fully customized windshield banner to promote any event for your business. These are the ideal option for your next open house sign. Available in a wide range of colors and styles, contact us to find out about your options. 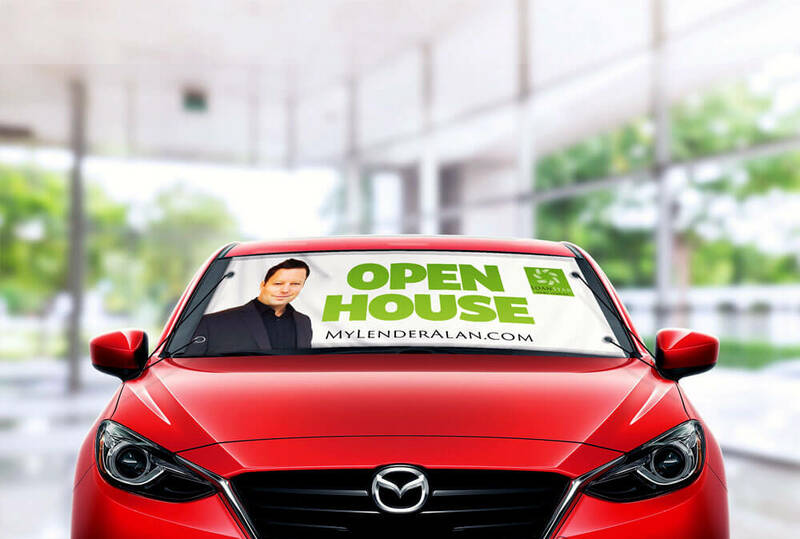 Our Custom Windshield Banners are the perfect open house sign to make sure everyone knows about your open house or other event. Boost your brand visibility with a bold and attractive design that gets noticed. Made from durable vinyl, these all-weather banners are easy to fix to your vehicle and remove. So order your banner today and let’s create a fantastic custom design for your business. Our fully customizable banners will get the attention your event needs to encourage more visitors. We have many other products that you can use to promote your open house or other event. Check out our Mini 3D Real Estate Flags, Custom Real Estate Flags, and Large Custom Flag Kits for more options.